Russian leader lays flowers at Islam Karimov's grave in Samarkand. Russian President Vladimir Putin has said that the death of Islam Karimov, the first President of Uzbekistan, has become a sad event and a great loss for him. "For me personally, and I spoke about this while in China yesterday, I had very good personal relations, I would say, trust-based relations, with Islam Kariimov, especially over the past few years. So it is a very sad event and a huge loss for me,’ Putin said at a meeting with Uzbekistan’s Prime Minister Shavkat Mirziyoyev on Sept. 6. The Russian president thanked the Uzbek premier for an opportunity to visit Samarkand and pay homage to Islam Karimov’s memory "who did so much for his country and for his people." "It is not just a question of stability, although it is the basis of prosperity of any country and any people, and he was able to do that when times were especially hard," Putin said. "Of course, we very much hope that all that was established by President Islam Karimov will be continued. We, for our part, are doing everything possible to support this way of our mutual development, to support the people of Uzbekistan, the Uzbek leadership. You can count on us entirely as the most reliable friends", Vladimir Putin said. Will the power shift in Uzbekistan have an impact on Russia’s economy? He said that "Islam Karimov has laid a very solid foundation in the relationship between our two countries, built our relationship as strategic partnership." He added that Russia cherishes relations with Uzbekistan, the ties between the two countries’ peoples and cultures. Russian leader also expressed his condolences to Tatyana Karimova - the widow of the president, and his youngest daughter - Lola Karimova-Tillyayeva. 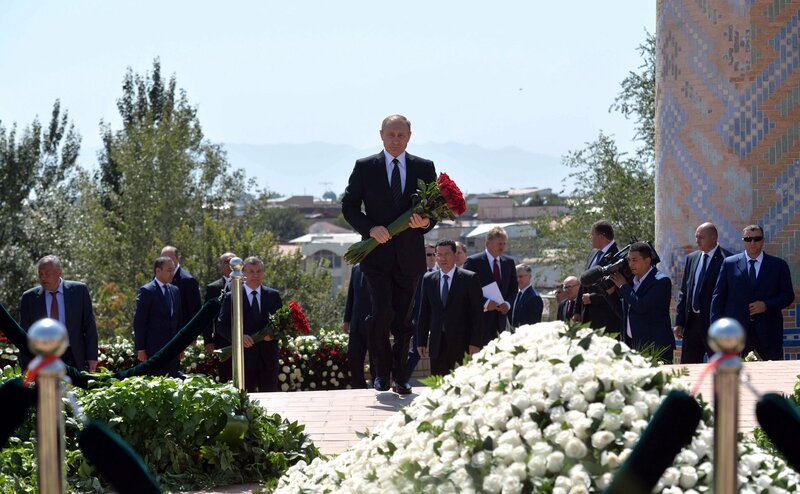 After laying flowers at Karimov’s grave at the cemetery near the historic monument of Shahi Zinda in Samarkand, Putin arrived at the Palace of Forums - the Samarkand residence of the President of Uzbekistan.